Bromine water is a dilute solution of bromine used as a reagent in a range of chemical experiments. While it can be made in a chemistry lab by mixing the fumes of liquid bromine directly with water, this requires the use of a fume hood and heavy protective clothing, and is not suitable for beginning chemistry classes. A more convenient method of making bromine water uses bleach and hydrochloric acid to break down sodium bromide, avoiding the hazard of handling pure liquid bromine. 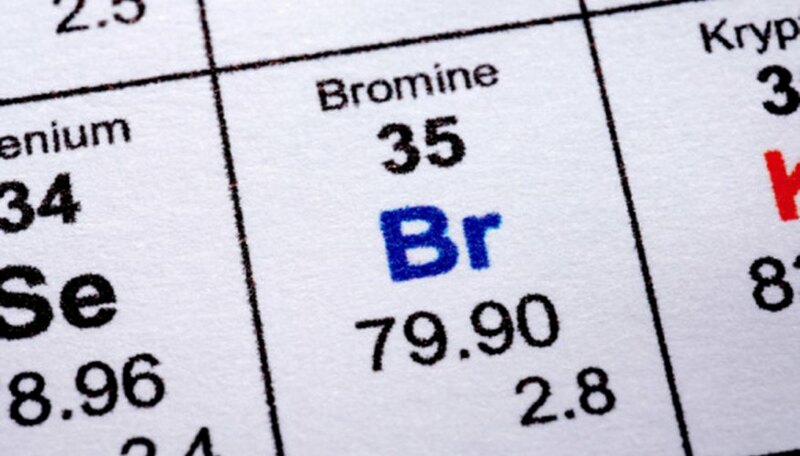 Label the bottle "bromine water" or "Br 2 (aq)." Dissolve the sodium bromine in the hydrochloric acid, mixing the compounds in a flask or beaker. Pour the mixture into the glass bottle. Add the bleach to the mixture in the bottle. Cap the bottle and swirl it gently to mix the ingredients. Dilute the mixture with distilled water, swirling gently to mix. Do not use scented or germicidal bleach for this solution. Check the label to ensure that the bleach is 100 percent sodium hypochlorite. Bromine water is corrosive and gives off hazardous fumes. Wear goggles and chemical-resistant gloves when mixing or working with bromine water, and only use bromine water in a well-ventilated area. Keep bromine water capped when not in use to minimize the spread of fumes. Clay, Charles. "How to Make Bromine Water in the Chemistry Lab." Sciencing, https://sciencing.com/make-bromine-water-chemistry-lab-8691301.html. 24 April 2017.